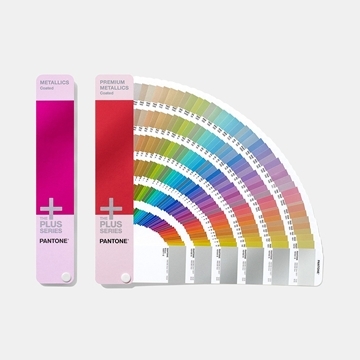 Pantone's Graphic System, often nicknamed PMS was launched in 1963 and is today the world leading colour communication tool for graphic design and print industry globally. With the Solid Guide and Solid Selector, you have access to some of the most known colours for brand identification like 286C. Which is your brand identity colour? Within the graphics system, there are special editions, like Pantone Metallic including 54 new Metallic colours, in total 655 colours, all in 1 guide + 1 selector. Contact us and we tell you more. Best practice, when do I use which value and for what purpose? How to get hold of the various codes? Welcome to contact us! 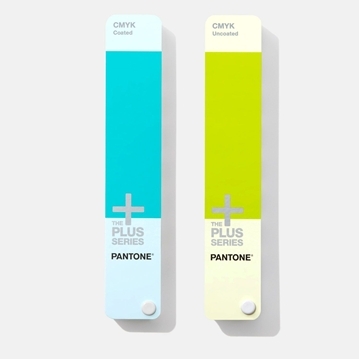 Pantone⋅Matching System, two-guide set with 1,867 colors. 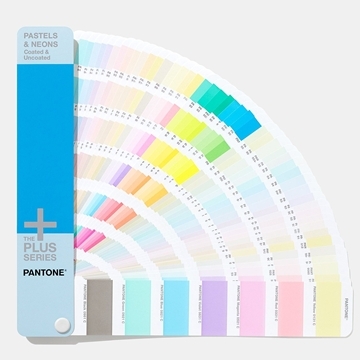 Includes all 112 new Pantone colours from 2016 printed on both coated and uncoated paper. Solid Chip consists of two specifiers – containing, in this updated edition; 1, 867 solid press-ready colours! 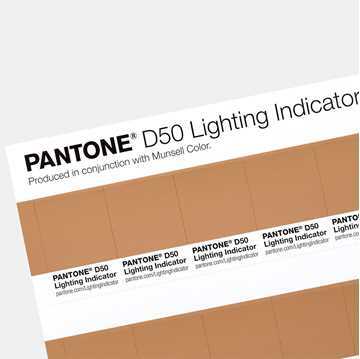 Since 2010, 756 colours have been added to the Pantone colours system – that reaches back to the 60’s. 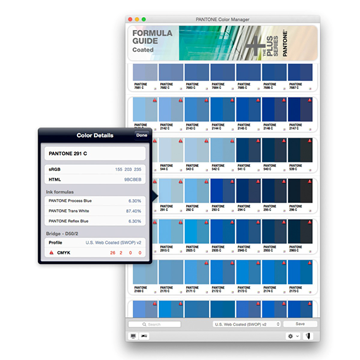 In 2016 edition, 112 new colours are being presented. If you haven’t updated your guide in the past five years; make sure to take part of the vastly expanded version, when the colours are freshly picked. 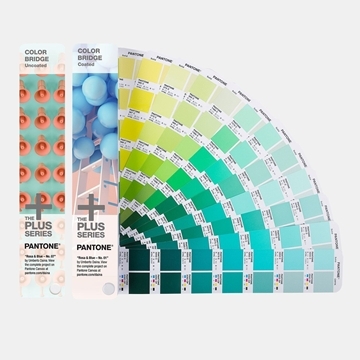 Solid Colour Set is a package-deal consisting of two colour-fans and two specifiers from the classical solid décor colours in the Formula Guide and Solid Chip Set. Colour Bridge assists you in the management of reproduction of printed colours, providing an estimation on how you should expect your colour to appear whilst printed, on coated paper. Referring to Pantone Matching System (PMS)-colours to sRGB, CMYK and Hex colours for both Web and HTML, this edition presents 112 new Pantone colours. Colour Bridge assists you in the process of the reproduction of printed colours, giving you an estimation on how you should expect your colour to appear whilst printed, on coated and uncoated paper. 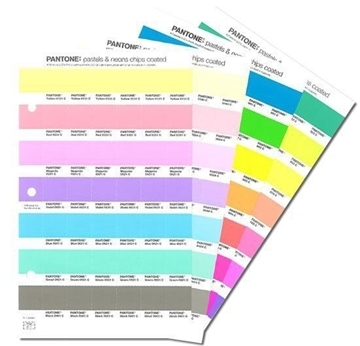 Referring to Pantone Matching System (PMS)-colours to sRGB, CMYK and Hex colours for both Web and HTML, this edition presents all 1845 Pantone spot colours. 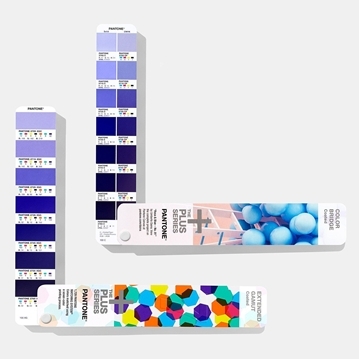 Colour Bridge assists you in the process of the reproduction of printed colours, giving you an estimation on how you should expect your colour to appear whilst printed, on coated and uncoated paper. 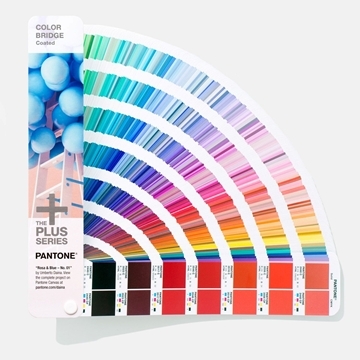 Referring to Pantone Matching System (PMS)-colours to sRGB, CMYK and Hex colours for both Web and HTML, this edition includes the 112 new Pantone colours. Here, you are presented with both versions of the Colour Bridge; both the coated and the uncoated version. 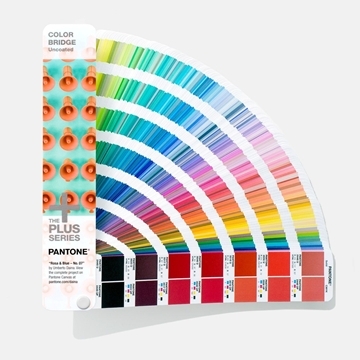 Pantone has introduced a new united process colour guide for the different print conditions in EU and the U.S. Divided into two four-colour guides, the CMYK guide presents a total of2 868 colours on both coated and uncoated paper. 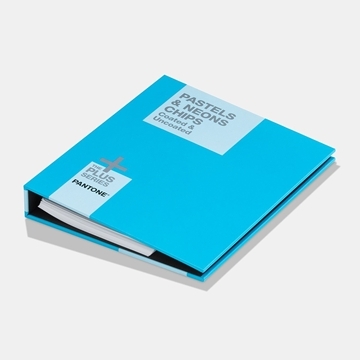 PASTELS & NEON Guide consists of 154 solid pastel colours and 56 solid neon colours, in both coated and uncoated format, all in one comprehensive guide. 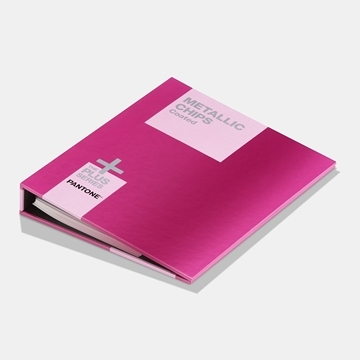 PASTELS & NEON Guide consists of 154 solid pastel colours and 56 solid neon colours, in both coated and uncoated format, all in one comprehensive Specifier. 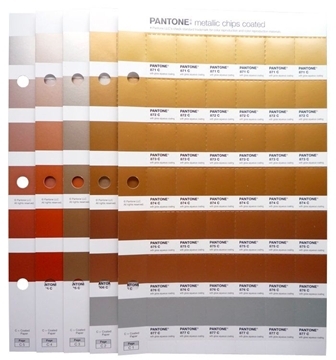 The PANTONE METALLIC CHIPS offer six specifications for each Pantone Metallic colour. 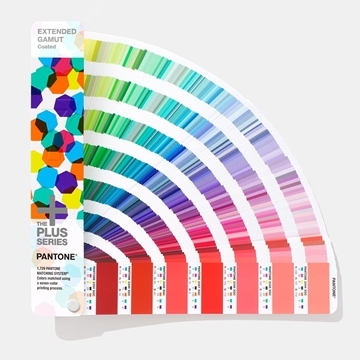 Here, over 300 chromatically arranged, brilliant metallic colours are being presented, on coated paper. 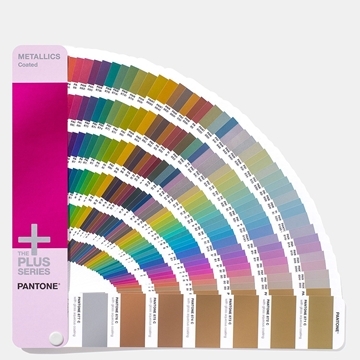 PANTONE PREMIUM METALLICS Coated contains 300 sizzling metallic colour-swatches, developed in response to the massively increased demand that special-effect- colours has received lately. Premium Metallic Colours have greater brilliance, can be easily coated without any loss in luster, as well as an increased protection against tarnishing or blemishing. 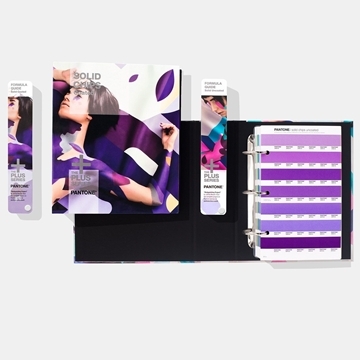 Solid Guide Set includes all five spot colour guides: Formula Guide Coated & Uncoated, Pastels & Neons, Metallics, and Premium Metallics. 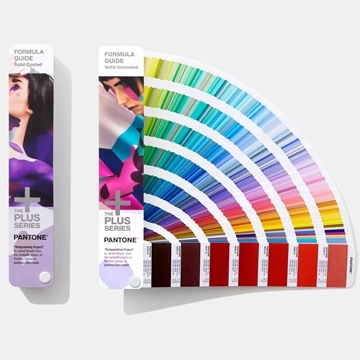 With all 2,678 colours in the Pantone Matching System, Solid Guide Set provides designers the greatest array of Pantone’s market-driven spot colorus. Use this set for branding, packaging, marketing materials, signage, and when spot colour printing is critical. 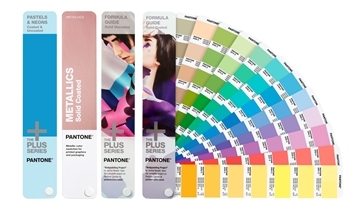 Set of six PANTONE® PLUS/PMS SERIES color guides. 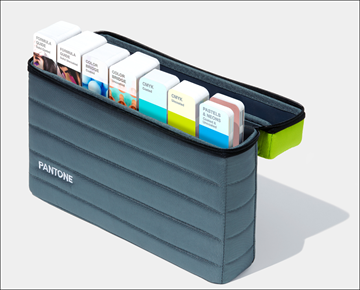 The PANTONE PORTABLE GUIDE STUDIO contains the complete set of all Pantones graphic guides. In total; 9 guides to be carried in the easy-to-use carrying case which will follow the product. 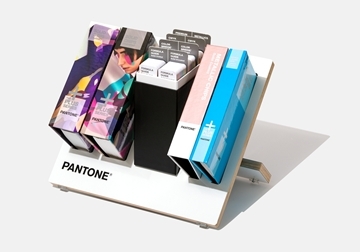 Consisting of more than 10, 000 colours within the Pantone Matching System, the Pantone Reference Library is the most comprehensive collection of all solid colours, solid-to- process colours, process colours and special effect colours. The library offer agents, design departments, printers or schools the ultimate flexibility and accessibility for inspiration, creation, specification, matching and confirmation of colours. Extended Gamut Coated Guide, matching system with 1, 729 colours, presented through seven-colour printing process using existing Cyan, Magenta, Yellow and Black (CMYK) inks plus commonly used Orange, Green and Violet (OGV inks that extend the colour gamut significantly. This seven-colour printing process is perfect for e.g packaging, labels and tags. Extended Gamut Coated Guide, matching system with 1, 729 colours, presented through seven-colour printing process using existing Cyan, Magenta, Yellow and Black (CMYK) inks plus commonly used Orange, Green and Violet (OGV inks that extend the colour gamut significantly. This seven-colour printing process is perfect for e.g packaging, labels and tags. As if this wasn’t enough, the Gamut Guide is complimented with a Colour Bridge, reassuring your access to the entire spectrum of colours. 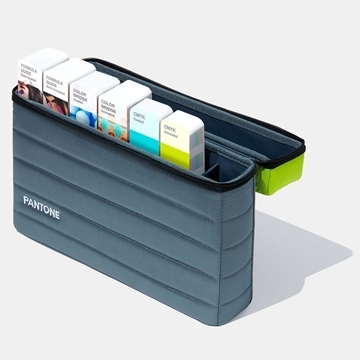 Individual replacement pages for Pantone Pastel + Neon system. Each color is printed on an individual loose-leaf-style page containing six tear-out chips. 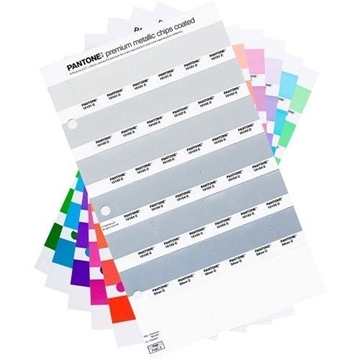 Individual replacement pages for Pantone Metallic system. perfection to the smallest details.